Construction work in progress at the base of one of the Great Water Towers which supply water to the many fountains in the grounds of Crystal Palace in Sydenham Hill. After housing the Great Exhibition of 1851 in Hyde Park, the Crystal Palace was dismantled and rebuilt in south-east London. 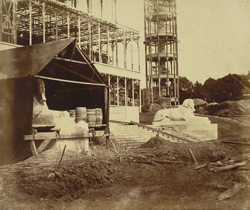 P H Delamotte was commissioned to document its reconstruction from 1852 to 1854 for the Crystal Palace Art Union.